The romanesque design of the building looked like it was from a Harry Potter’s movie! The museum itself is huge! 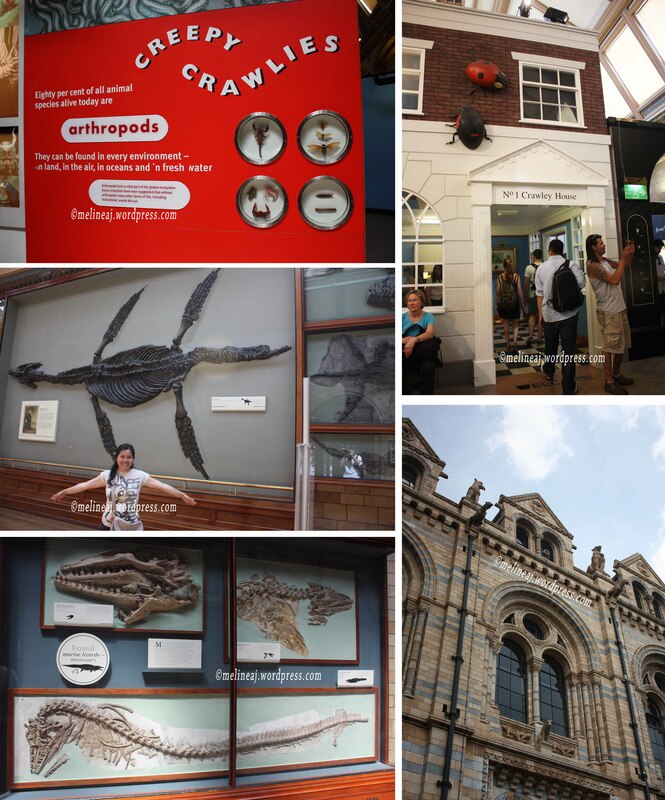 The museum has 4 big sections: dinosaurs (blue), earth ecology (green), geology (red), and Darwin centre (orange). We didn’t have time to explore all the sections of the museum. 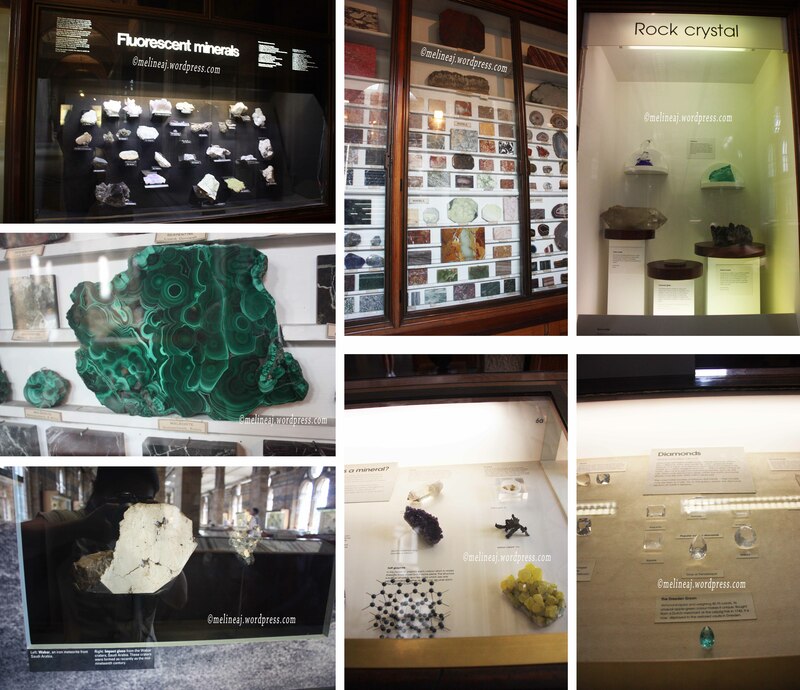 We only visited the famous dinosaur section, briskly passed through the glass cases containing animal taxidermy, and took a peek into a massive gemstone collection room. Don’t forget to visit the Vision of Earth room that has a giant globe surrounding the elevator from the Exhibition Road entrace. Sadly, we missed to see this cool feature. As soon as we entered the building,there is a big dinosaur greeted us. COOL! 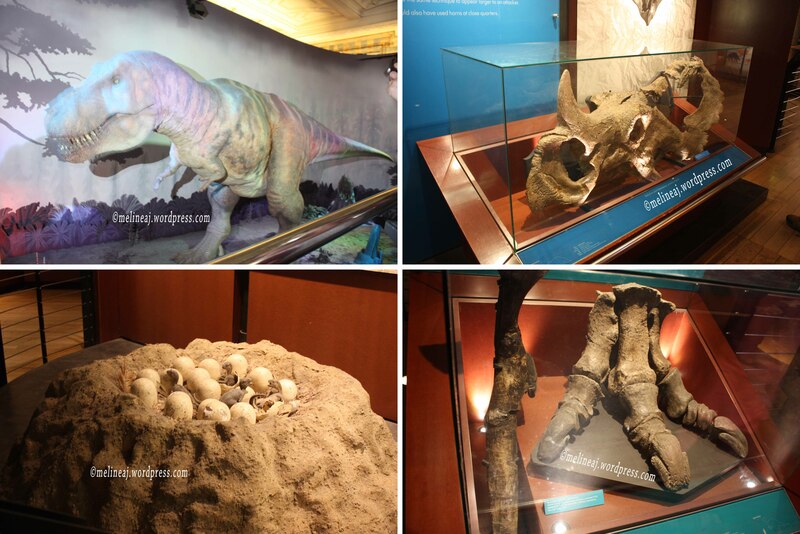 We found a map on one of the wall and decided to visit the dinosaur exhibit first as it’s the most popular exhibit. Still on the blue area, we entered the Mammals section. 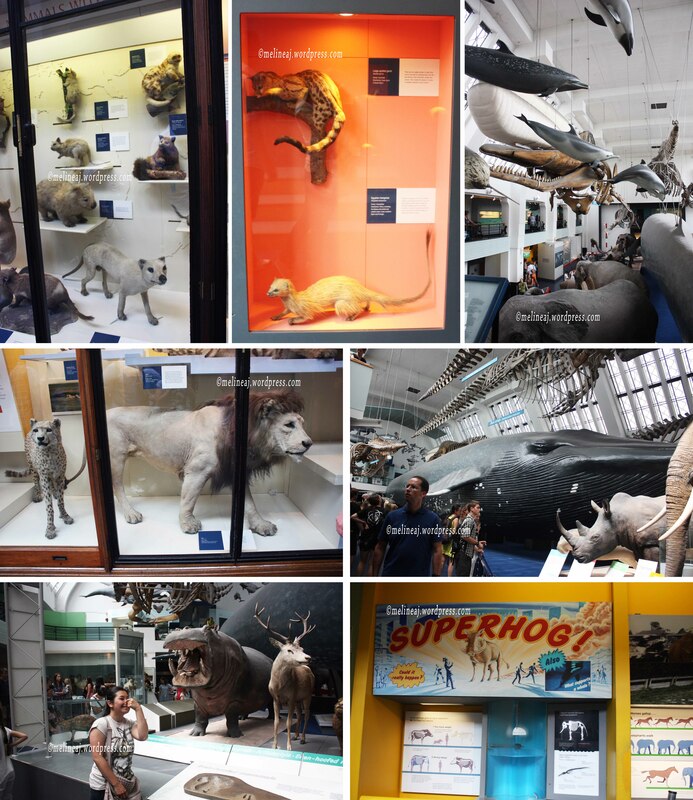 Here, we saw a lot of animal taxidermies inside rows of glass cases. 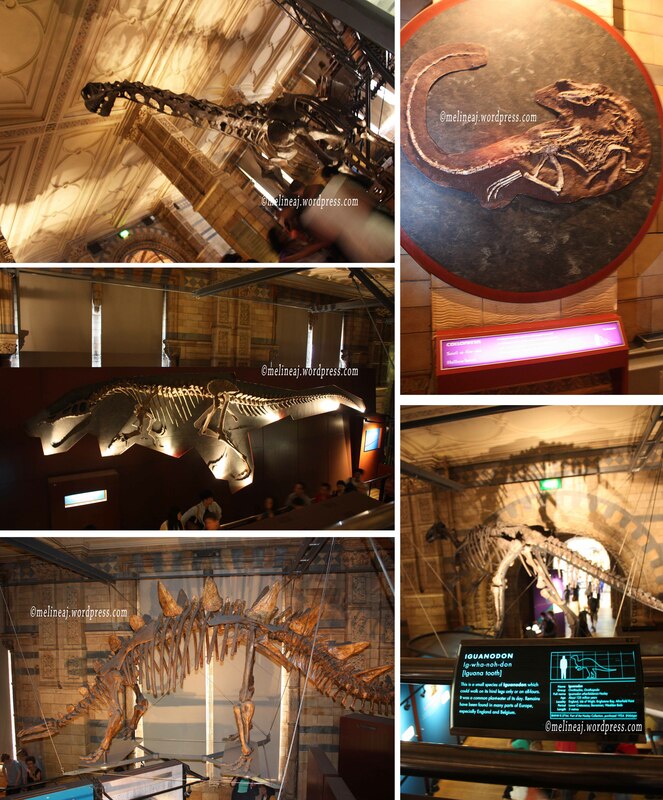 At the centre of the room, they displayed the full scale of blue whale and other aquatic mammals. This exhibit may be very interesting for smaller kids as they could see the real size of the animals. As for me and my hubby, we just briskly scanned the room and moved on to the next exhibit. At the back of the blue area, there was the Reptile and Amphibian section. There was a small room full of glass cases displaying beautiful corals. 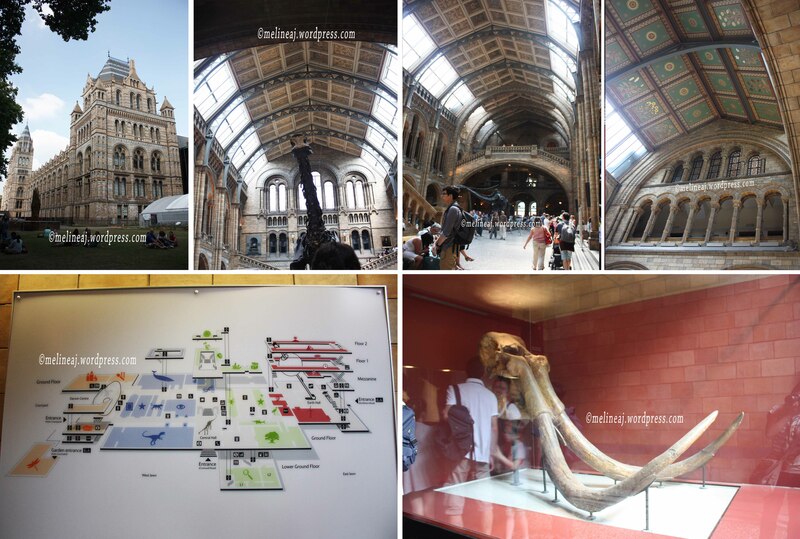 Back to the central hall, we went to the 2nd floor where Charles Darwin’s statue is. On the east side of this floor, there is a Charles Darwin exhibit. 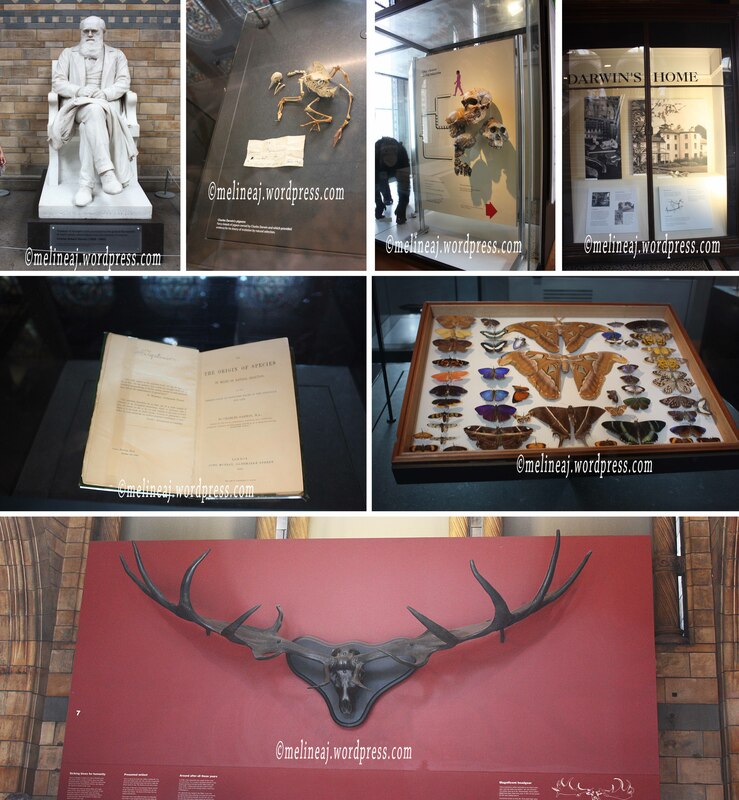 The famous “Origin of Species” book that was published in 1859 and he Darwin’s butterfly collection are among the exhibit. It also has a human evolution display showing the different skulls from Neanderthal to Homo Sapiens. At the very back of the room, there was a vault containing precious minerals that are believed only one in the world! There are the Devonshire Emerald (biggest emerald ever known), Latrobe nugget (a crystallized gold), many other unique minerals. The one that really catched my eyes was the purple cursed amethyst. Rumor has it that whoever owned this amethyst will have a series of bad luck becuase the stone was acquired through a blood shed. The previous owner even bonded the stone between two headed snake to neutralize its power before gave it to the museum *spooky…* In addition to the interesting amethyst story, I was actually blinded by the diamonds set in a triangle stand. They were so pretty! Moving downstairs to another green zone, we entered the Creepy Crawlies exhibit. This interactive room was pretty fun for smaller kids. They can learn all different kinds of bugs by playing some of the games there. By this point, my husband, who is not really into biolgy and nature, got bored. So, we decided to end our visit. 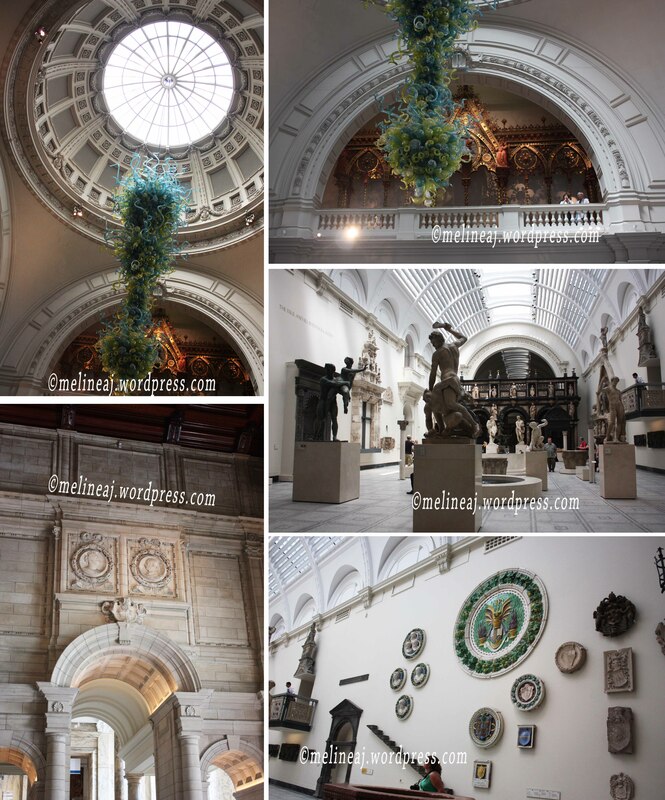 Not far from Natural History Museum, there is Victoria and Albert Museum. This museum houses hundreds of art and design related objects from around the world. The exhibit ranges from ceramics, glass, textiles, jeweleries, photographs, etc. It even claimed to have “the world’s largest collection of post-classical sculpture” outside Italy [ref]. The museum entrance is free, but in order to see the special exhibition, you need to buy a ticket. When we were there, the special exhibit was London Fashion in 80’s. I decided to sit at the lobby while my husband explored the museum since my ankle started to hurt so bad. My husband was on a mission to see the Indonesian exhibit in the museum. He visited room 47a on the 1st floor and saw the stone sculpture collected from Buddhist temples in Indonesia. We only spent half an hour in V&A Museum and decided to have a lunch. With full stomach, we marched toward Harrods. The first thing I wanted to see in this upscale department store was the market! Passing the luxury accessories on the ground floor, we finally found the market at the back of the ground level. Harrods’ market has very interesting concept. It was decorated beautifully for each section. There are meat section, boulangerie, cheese shop, steak shop, oyster shop, bar, and even its own coffee section with different types of beans! There was also a Laduree shop inside the market if you want a taste of a good macaroon. Going up to the second floor, we entered a small bookshop. Here, I saw a collection box containing Beatrix Potter’s Peter Rabbit books! I was super excited and pretty sure was going to buy it until I saw the price – the whopping £120!!! My husband immediately pulled me away from it hahahah… *When I was back in Vancouver, I was immediately on a hunt for this set and I found the older version for only $40! * It also had a Royal Baby book even when Prince George hadn’t born yet! Going to the next section of the department store, we entered the Harrods’ gift shop. I wanted to buy Harrods bags as they have distinctive pattern. However, I couldn’t find the one that I really liked, so we only took pictures with Harrods’ Teddy Bears wearing different costumes. On the third floor, we checked out the Technology section as my husband requested it. The devices sold there were pretty similar to the ones sold in North America. 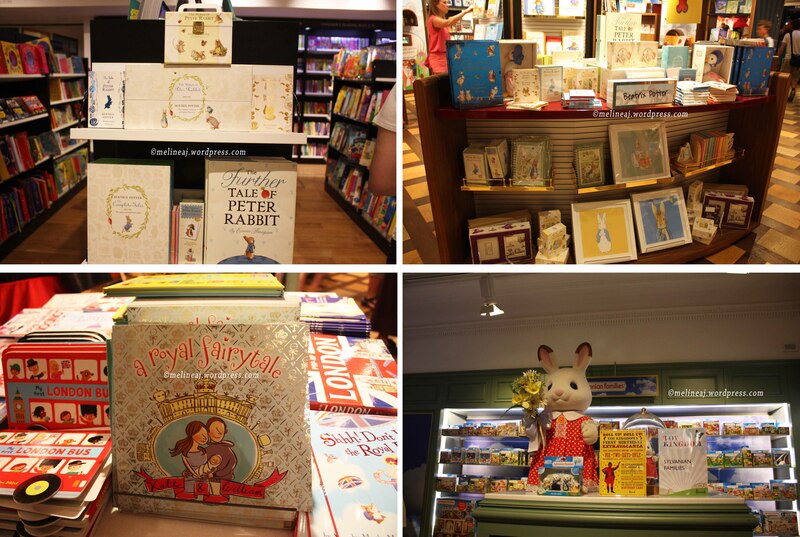 We then went to the Toy Kingdom – just to browse and kill our time. We also passed a Christmas section selling everything marked with Harrods logo. It was crazy that they have its own Christmas section when it was in July! Oh did I tell you that the escalator has beautiful ceiling with Egyptian theme! The Egyptian themed ceiling and decoration & Harrods’ Christmas section! While resting our legs outside Harrods, me and my husband discussed our next destination. Our Airbnb host suggested that we go to Greenwich for strolling in the park. So, we decided to do that. From the Knightsbridge station, we took the tube to Waterloo station. We crossed the Jubilee Garden – where the London Eye is – to get to the Pier. The river bus to Greenwich is £6.50/person but since we had our TravelCard, we only paid £4.30/person *sweet! 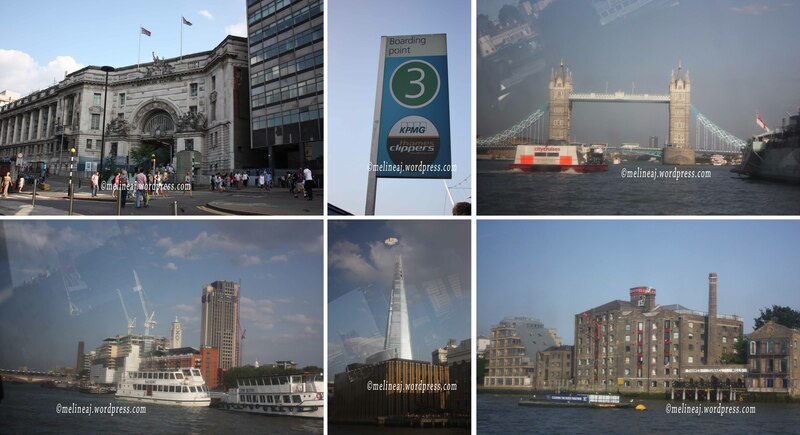 * When we rode the boat, there were lots of people going to O2 arena. Apparently, there were going to Michael Buble’s concert! What a coincidence! The boat ride was about 20-30 minutes long. We passed under the Tower Bridge and enjoying the view of buildings along Thames River bank. When we arrived at the Greenwich Pier, it was around 5 o’clock. Since my husband was pretty hungry, we went inside Byron restaurant to buy a burger for him. The hamburger was actually good! The Greenwich Park is actually a big park! 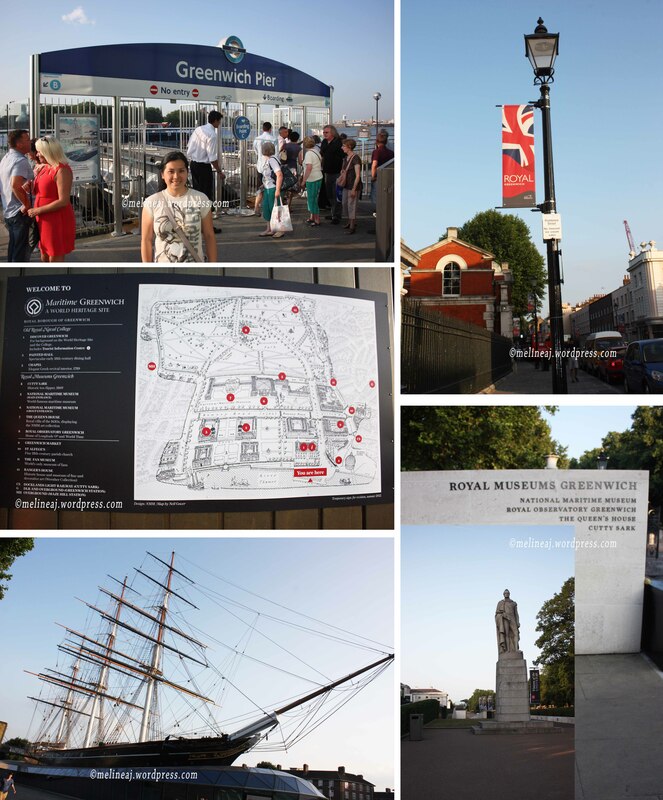 Cutty Sark museum, National Maritime Museum, and Royal Conservatory Greenwich are some of the attractions in this area. 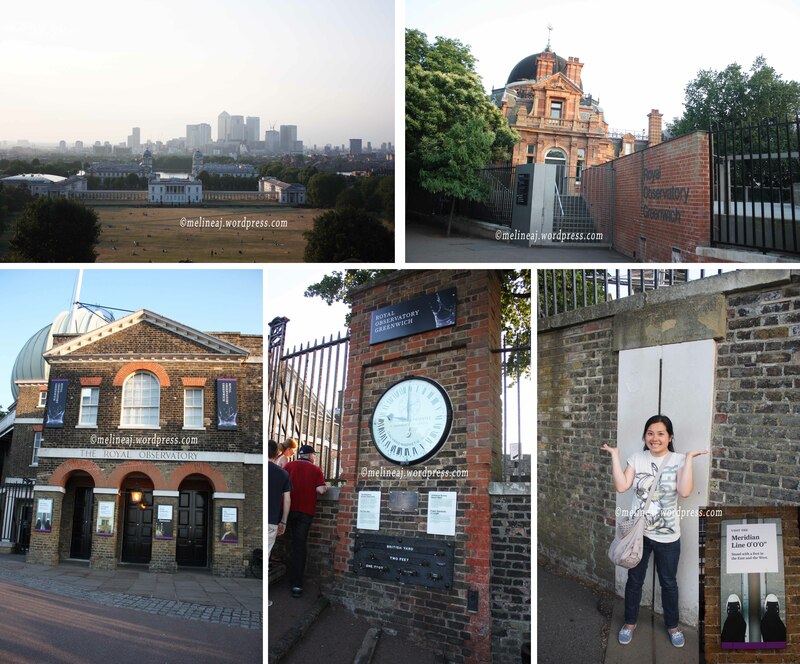 My main purpose coming to Greenwich was to see the zero meridian line, so right away, we went for a hike toward a hill to reach the Observatory and the meridian line. As I suspected, the Observatory was close as it was pretty late. Yeah… I was a bit disappointed not being able to take picture of the meridian line. So, we walked toward the back of the observatory but we found nothing. Then, we went back to the front of the observatory and enjoyed the sunset with London as the background. When we were about to walk down the hill, I saw that there is a grey stone plaque with a line underneath it. So, I insisted to go to a little path in front of the observatory fence. And viola… there was the 0°0’0″ meridian line! Me and my husband took turn to take picture and apparently lots of people followed us hahhaa… On the way back toward the pier, we saw a bus stop near the Maritime museum. Since we didn’t have anything to do, my husband suggested that we took a bus back to Elephant & Castle area so we could see London more intimately 😛 We took double decker bus #188 back to apartment. The ride was about an hour long but we really enjoyed the suburban side of London. Day 18 of our Europe trip! Sadly, it was our very last day in London. We woke up at 5 am that morning since we had to take buses to go to Gatwick Airport for our 9.40 am flight! REMEMBER: The tube starts to operate LATE on Sunday!!! We were pretty lucky that the bus stop for bus #45 was close to our apartment. Early morning in London was so quiet and peaceful – except that there were some homeless people sleeping on the sidewalk. We got off at Blackfriar Station at about 6.15 am. There was nobody at the station since only train operated at that time. We were a bit confused as which ticket should we chose for the train. There was no one at the ticket booth and even there was nobody to answer the ‘information phone.’ And the train was coming pretty soon! I was freaked out!!! Finally, we purchased 2 one-way ‘NOT UNDERGROUND‘ ticket to Gatwick for £10 each (do NOT select the ‘Anytime’ since it was more expensive!). We arrived at Gatwick Airport pretty early. The separate terminal for Air Transat was pretty small and there was only one cafe where we had a quick breakfast before boarding. So long, London! Till we meet again! Bye my cute new friends! Will miss you a lot! 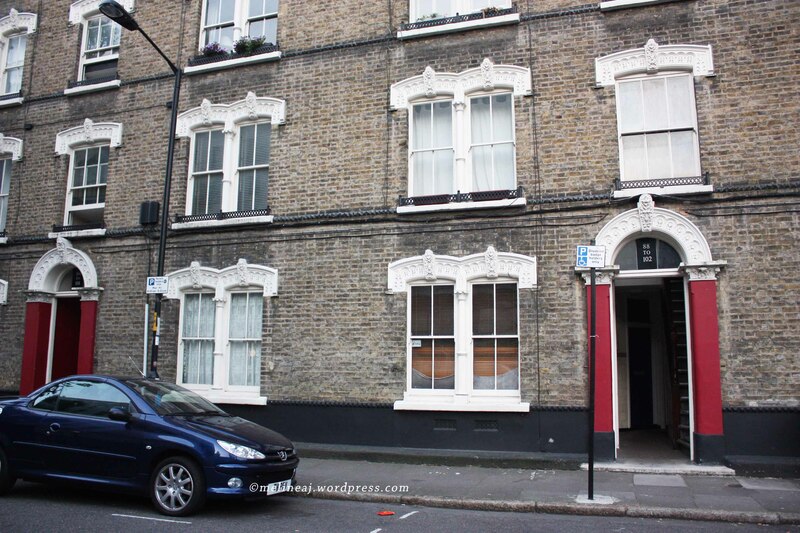 and of course, I will miss the cute London tiny apartment building!